Are there solutions that can work – and last? The original intention ◄- -► The actual outcome! Second, Overeating Unplugged shines a light on the nature of motivation and the myth of willpower: if you’ve been battling with the same solution over and again, and got nowhere, far from being weak willed, it might be said instead that you have great perseverance and resolve. The problem is not your willpower. The problem is you keep using the same solution over and again and so get the same outcome. If you do what you did before, you’ll get what you had before. No mystery there. 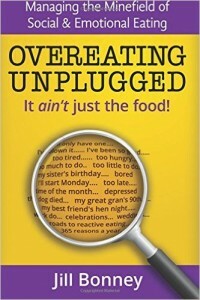 Overeating Unplugged will help you get wise to this, and revise your approach. In essence, the motivation we need to change how we eat, or lose weight, and the motivation we need to maintain that weight, are two very different processes. One is driven by a need that has reached a top priority status. It may be a desperate situation, like a wake up call from your GP; it might be that your ex is remarrying and you so cannot turn up at the wedding s/he’s invited you to, looking as you believe you do; or it might be a fantastic occasion that warrants you looking and feeling the best you can. Whichever, this motivation has great lift off power. It has rocket fuel lift off power. It is utterly fantastic, but it’s the psychological equivalent of an adrenalin surge – so it isn’t designed to last. It’s a reserve fuel for the emergency or the honeymoon – but it runs out once a level of what we need is achieved. This is where the other type of motivation comes in. It’s long term, it’s the distance runner, and it has to last the course. I call this your M.o.T. – Motivation over Time. In order for this to last, you have to really, really want whatever being slimmer and healthier means to you, and you have to remember you wanted it. Life and other priorities has a habit of getting in the way, and with it, all the old habits you thought were long since buried. They are rarely buried. They are waiting in the undergrowth to spring forth once again when you forget. So the “gap” here involves the need for recognition: recognition of the different types of motivation. Recognition of the importance of knowing what it is you want and remembering to review and check that over time. And recognition of the power of habit, which many people underestimate.